(I couldn’t figure out the business model of Social Honey (Rockstart)). There is no clear sector preference at SBC; the startups range from bio to logistics to tourism to sport. On the other hand, at Rockstart I see that three startups are active in education, two in media and two in sales. For SBC, this breakdown is comparable to last year. Rockstart has moved a bit to later stage (i.e. towards revenue generation) compared to last class. Needless to say, the small sample sizes make it impossible to draw hard conclusions. Let’s have a look at the startup version of the Ansoff matrix. I plotted all 21 startups in this matrix, based on the how new the technologies and markets are (click for enlargement). SBC has seven startups in this quadrant, Rockstart six. These startups will aim at making existing processes more efficient, such as sending parcels (SendCloud), learning a new language (CoffeeStrap) or controlling processes (Iristrace). The main challenge for these startups is securing their competitive advantage because their concepts can relatively easily be copied by competitors or new entrants. Rockstart and SBC have four respectively one startups in this quadrant. These companies use existing technology in a smart way to address or create new markets. For example, Bomberbot uses basic software to teach children how to code, Songvice uses existing technology to connect aspiring musicians to music instructors, and Formtaste Innovations has developed a self-service printer kiosk (based on existing tech I assume) for a new market of urban professionals who need access to printing services on the go. The biggest challenge for these startups is to generate market acceptance and expand market leadership. Marketing and creativity, core competences of Rockstart, play an important role in their success. 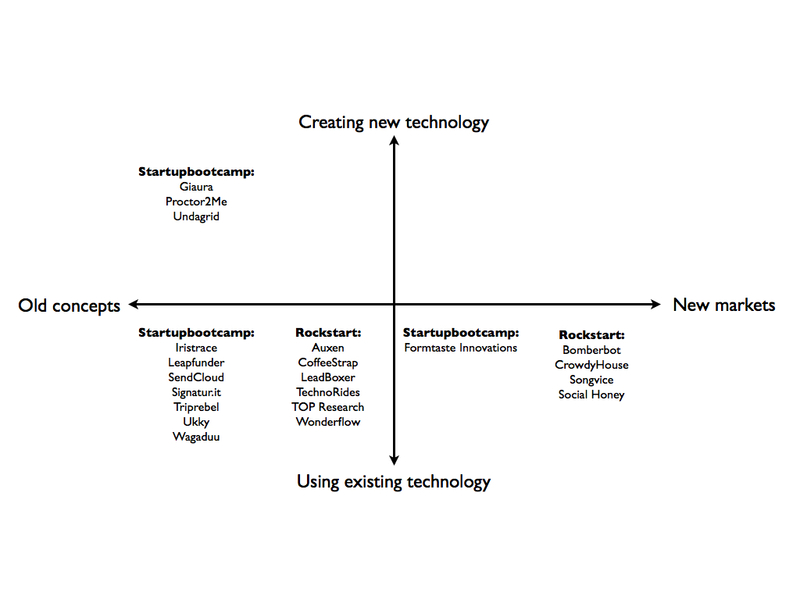 SBC has three startups in this quadrant, versus none of Rockstart. These startups use new technology to address existing markets. Giaura has developed a new hardware technology for capturing and releasing CO2, that it wants to apply in (among others) aquariums, greenhouses, and industrial applications. Proctor2Me uses a combination of old and new tech to detect cheating at online exams. Undagrid has developed low-power wireless sensors that can be used to build a network, for example to locate carts and stairs at airports. In general, the products of the startups in this quadrant are well positioned, and are bought (requiring lower marketing investment) instead of sold (which requires a higher marketing effort). Technology risk is the biggest challenge. Unlike last year, none of the startups are in this quadrant, with new technology that creates new markets. Again I think that both accelerators have an own profile, based on their portfolio of startups. Rockstart has software-only companies and seems to have a sector preference (education, media, and sales). Besides the startups with existing technology in existing markets, most of their startups are in the quadrant of existing technology in new markets. The biggest challenge for these startups is to generate market acceptance and expand market leadership. Marketing and creativity, core competences of Rockstart, play an important role in their success. Startupbootcamp (SBC) selected startups that are active in hardware as well. 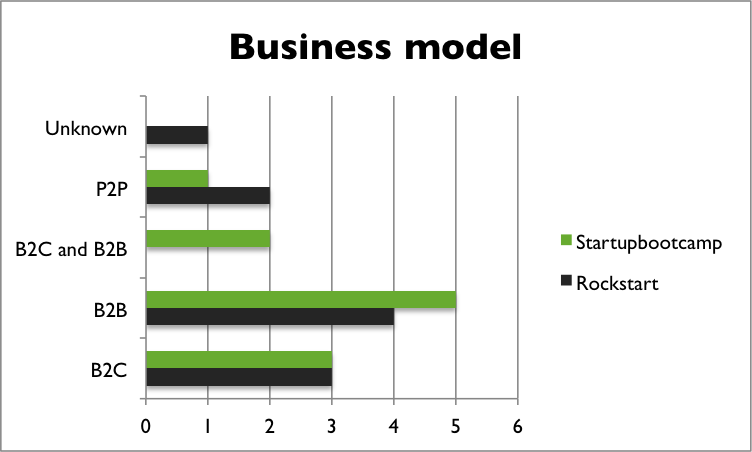 Unlike Rockstart, there seems not to be a strong preference with regard to industry. Last year, SBC startups were strongly represented in the B2B segment, but that doesn’t hold this year. Although most startups are in the existing tech – existing market quadrant, the most interesting fact is that SBC has three startups that develop new technology in existing markets, where Rockstart has none. Not market acceptance but technology risk is the biggest challenge for these startups. I do think that last year the accelerators distinguished themselves more though. This year they seem to have more in common, as if both accelerators converged towards each other. Rockstart selected more B2B startups and more startups that generate revenue already, while SBC selected more B2C and P2P compared to last year. I’m looking forward to the demo days already. Good luck to all startups! PS. 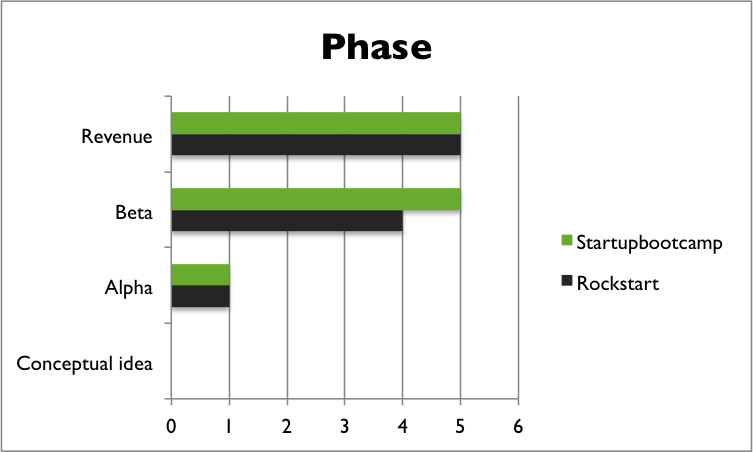 I am currently analyzing the performance of the 2013 classes of SBC and Rockstart, based on their momentum. If you’d like to be notified when this post is ready, follow this blog or follow me on twitter (@tjmensink). Disclaimer: I do not personally know all startups or entrepreneurs, so a large part of this analysis is based on publicly available information. I have probably made ​​some mistakes or misinterpretations. Let me know what could be improved. I wish all the startups and the two accelerators the best of luck. Dit bericht werd geplaatst in Accelerators & Incubators en getagged accelerator, Amsterdam, ansoff, Auxen, Bomberbot, business model, CoffeeStrap, comparison, CrowdyHouse, Formtaste innovations, Giaura, Iristrace, LeadBoxer, Leapfunder, phase, Proctor2Me, rockstart, SendCloud, Signatur.it, Social Honey, Songvice, startup, Startup Bootcamp, startupbootcamp, TechnoRides, TOP Research, Triprebel, Ukky, UndaGrid, Wagaduu, Wonderflow door Thomas Mensink . Bookmark de permalink .